DATOW -- Lot Control is a computer program to track all vehicles that enter your storage yard. Charge information and other details about the vehicle are instantly available. A release invoice is made when the vehicle is released. Reports help you to manage your business. In short, it does everything you need it to do to manage your storage lot(s). Each vehicle is assigned a sequential LOG number by the program. Once entered into the system, the vehicle can be retrieved by that LOG number or by the PLATE (or ANY part of the plate), VIN (or ANY part of the VIN), YEAR, MAKE, MODEL, DATE-IN (exact or on-or-before), Income Code (e.g. CHP, PPI, local police, etc.) and/or IC# (internal control number -- usually the CALL number). Also, Color, Model, Location, Released To Name, Released To ID, Invoice Number - In short, nearly any way that you can think of looking for a vehicle! Once retrieved, the vehicle may be released or information about the vehicle may be modified. (These functions are Password controlled as to both access and extent.) Up-to-date Storage charges are automatically applied to CURRENT vehicles and TOTAL CHARGES are automatically calculated as additional charges (mileage, stand-by, etc.) are added. Upon release, CHANGE is calculated if the operator enters an amount received greater than the TOTAL. A negative number is calculated and applied if the amount received is less than the TOTAL (as in the case of a Lien Sale or a surrendered Title). When a vehicle is released, information about the person it was released to and the employee who released it is maintained. A release invoice is printed and a sequential invoice number is assigned (or you can allow for the manual entry of an invoice number). The release invoice is printed on a half or a full page of paper. If a full page is used, you may print any text you choose on the lower portion of the page. Some users print a coupon for a discount off future services. Up to 3 release invoices may be printed at time of release. A duplicate invoice may be printed if authorized by the password/access control assigned to the operator. Extensive reports on CURRENT, RELEASED, INCOMING (both current and released) and ARCHIVED vehicles are available in both printed and on- screen formats. Legal requirements for DOJ (Dept. of Justice) and LOG BOOKS are supported. DATOW also features the ability to export information to other programs. In this way, you can create charts, graphs and customized reports using programs like Excel or Lotus123. Released vehicles may be posted to the Accounts Receivable (A/R) program so that accurate totals of cash received at the release window is tracked. Although a rare occurrence, vehicles may also be released to Charge Accounts. An invoice is generated in the A/R so that all the customer's transaction(s) will appear on the A/R's monthly statement. A printed report is automatically generated to provide an audit trail. DATOW supports the automatic inclusion of a third fee (in addition to TITLE SEARCH and LIEN SALE) called COST OF SALE if the date of release is on or after the lien sale clear date. The time of release is automatically entered into the vehicle record (with operator override capability, of course) and printed on the release invoice. Vehicles on police HOLD may not be released until the operator specifically changes the Yes to a No in the HOLD field. The Yes flashes yellow if the vehicle is on HOLD to alert the operator that a police release is required. Released vehicles may also be accessed for viewing or modification. An easy-to-use on-line archive capability ensures fast access to any vehicle EVER entered into the system. User assigned charges may be automatically applied to each vehicle for Lien Sale Costs. Legal Owner Notifications are also automatically printed with a special charge applied as per California Vehicle Code. Other states often have similar needs, so this capability is useful for our users nationwide. You can easily modify this letter to suite your own needs, or we can help you. DATOW PROfessional Edition is a fully multi-user program, which allows more than one person to operate it at the same time. In cases where two or more vehicles are entered simultaneously, each vehicle will receive a unique and sequential LOG NUMBER. In cases where two or more users are attempting to change information about the same vehicle, the first user to store the changed information is successful. The other user is advised of the event, refused permission to make the change and automatically presented with another opportunity to effect the change while being shown the new, updated information that was just entered by the other user. Record locks are never performed in the human time domain, but only are applied by the program in the computer's time domain -- usually a few hundredths of a second! This eliminates many of the problems found in programs developed using standard database managers such as Dbase. A Dbase user may be locked out for extended periods of time while another user is accessing the data or where the "death" of a user results in orphaned locks or deadly embraces. 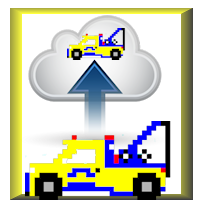 These conditions, while rare, do occur and will cause other towing programs we have examined to lose data, crash, hang or in some other way require the intervention of a human manager to clear the condition or reset the computers.